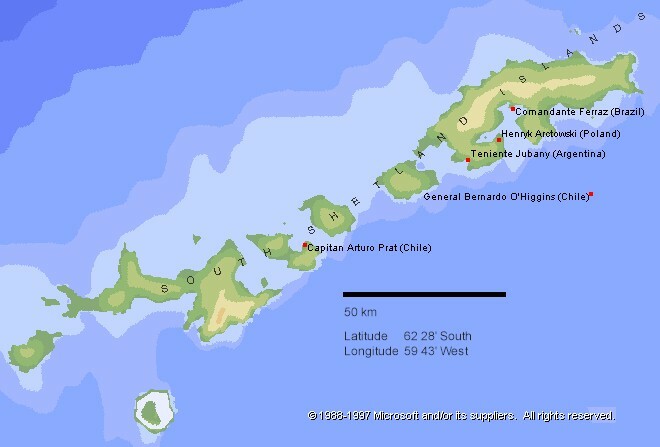 A 540 km chain of four main island groups, some are volcanic, including eleven major islands (Elephant and Clarence Islands; King George and Nelson Islands; Robert, Greenwich, Livingston, Snow, and Deception Islands; Smith and Low Islands) and several minor ones with many islets and rocks. Located about 120 km north of the Antarctic Peninsula in the Southern Ocean. Highest elevation: 2105 m (Mount Foster, Smith Island). Sighted and first landing 1819, sealers arrived 1820. Permanent occupation (scientific station) from 1944 (previously sealers and a scientific expedition wintered unintentionally, and a garrison was deployed briefly). Whaling station operated at Deception Island 1912-31. British territory, part of British Antarctic Territory; also claimed by Argentina, part of 'Antartida Argentina'; and Chile, part of 'Territorio Chileno Antartico' (under the aegis of the Antarctic Treaty).